Relaxation and comfortable rest is what we aim to get when we go to sleep at night. Our bodies are tired from the long day of work and/or play we just accomplished, and when it’s finally time to lay our heads down, we want to rest on something that is both comfortable and supportive. Something that helps you sleep versus something that keeps you awake, tossing and turning, hot and uncomfortable. Cooling pillows are highly sought after as they provide both comfort and support while allowing the sleeper a soft place to lay their head – but not on an overheated area that will just bring discomfort through the night. The problem with cooling pillows is that there are so many to choose from and, simply stated, some aren’t nearly as good as the others. In an attempt to make the process a little easier, we’ve listed our top picks; our Gold Pick, Silver Pick, Bronze Pick and Budget Pick. Hopefully this will help you choose your best cooling pillow, or at least help you in knowing what to look for when searching. If you’re a side or back sleeping looking for a cool – both figuratively and literally – pillow that supports and aligns your spine as you sleep, a good choice to check out is the ViscoSoft Arctic Gel Contour pillow. The Arctic Gel Pillow has a unique curved, ergonomic design that shapes to your head and neck as you lay down. 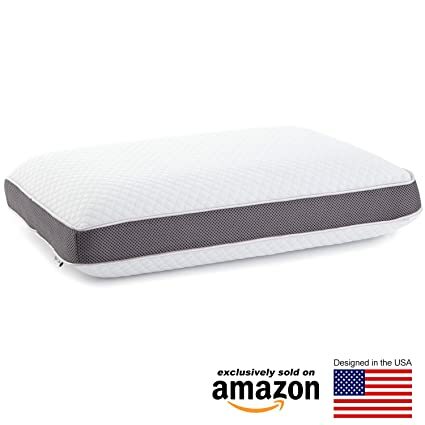 It is made from durable Molded Memory Foam, which is a highly dense material that softens with your body heat to mold and shape perfectly around body. From this, it balances your pressure points relieving stress and aligning your spine properly. This give your perfect support as you sleep throughout the night. Also, this foam is pressure sensitive, so if you switch positions it will gently adjust to your every movement so to keep your spine correctly aligned. This really helps with those every day neck and back aches and pains. Another great thing about this Memory Foam is that it is made from all natural materials – a blend of down feathers, bamboo and cotton. With the use of these natural materials used, this makes the Arctic Gel Pillow a hypo-allergenic pillow, a wonderful plus for many people. That the pillow is hypo-allergenic means that if you suffer from allergies, this pillow not only will not agitate those allergies, but prevents other outside allergens from entering the pillow. This allows for everyone to have a restful night’s sleep. A cool feature of this pillow is that nearly the entire top surface of the Arctic Gel Pillow is covered in ViscoSoft’s cooling gel technology, WaveFlow Cooling Gel. This is a 30% larger surface area coverage than other comparative pillows and it equals out to nearly 2-pounds of cooling gel used. Made up of Cooling Silica Gel, the WaveFlow Cooling Gel provides a long lasting cool and comfortable sensation that works to balance your body heat as you sleep. It does this by absorbing the ambient heat from your head, neck and shoulders and distributing through the pillow to circulate out, then working to cool you off with its cooling technology – all as your sleep comfortably through the night. Containing the Molded Memory Foam with WaveFlow Cooling Gel top surface is ViscoSoft’s CoolMax cover. The CoolMax cover is also a pretty neat feature to this pillow. It’s soft and made of specially engineered polyester fibers. These fibers improve the breathability of the fabric which assists in releasing excess heat from the pillow. Also, these fibers have moisture absorbing properties, or moisture wicking, which allows for a cleaner, fresher pillow. No waking up on a damp surface. The CoolMax cover easily comes off the pillow by zipper and is machine washable. 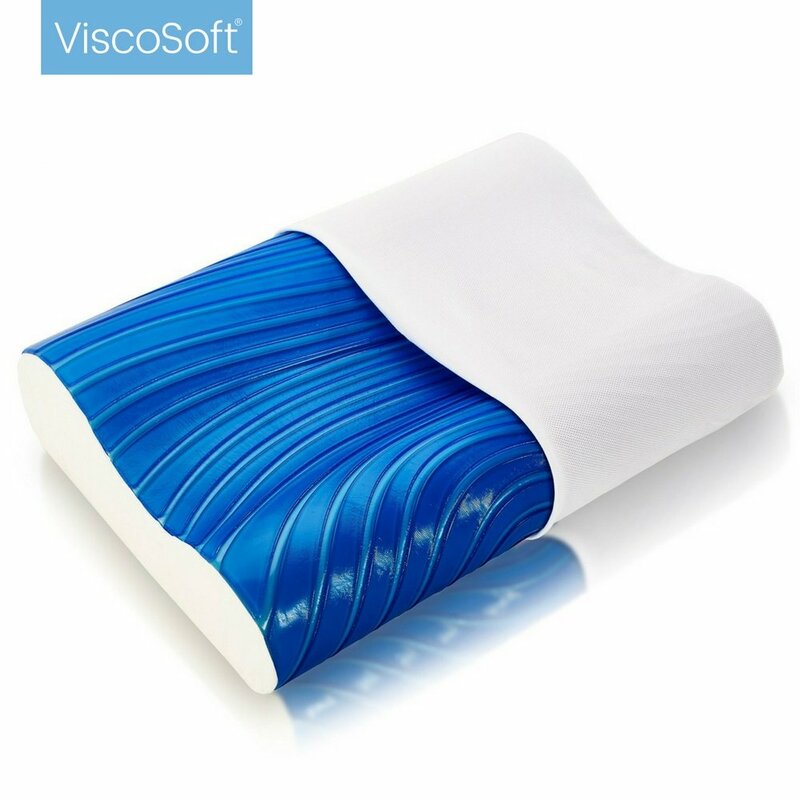 The feedback about ViscoSoft Arctic Gel Contoured Pillow is primarily positive. Of those who purchased and used this pillow, most all of them found the pillow to be of great quality, loving the support it provided to their head, neck and shoulders and relieving some of their aches and pains. Other customers disliked that the chemical smell that typically comes with all Memory Foam products, was strong and lingered longer than they wished. Airing the pillow out in a well ventilated area may help with releasing some of that lingering chemical odor. Other customers found the pillow absorbed their heat and became too warm for their liking, making them hot as they slept and noting that the cooling gel didn’t stay cool for long. The ViscoSoft Arctic Gel Contoured Pillow is on the higher side of “moderately priced”. It is a little smaller than the standard size pillow measuring 20-inches by 14-inches by 4.5-inches. Another cooling pillow to consider that provides good support is Perfect Cloud Dual Option Cooling-Gel Memory Foam Pillow. This pillow is great for those back and stomach sleepers. Unlike ViscoSoft’s Arctic Gel Pillow, the Dual Option Colling-Gel Pillow is, obviously, dual sided. But what exactly makes this unique and why is it pointed out? It’s all in the design of the pillow. When you’re just looking at the pillow, it looks like your average pillow, flat on both sides. Looking closer you’ll notice a dividing middle layer. That layer is drilled with many ventilation holes and has a gusset siding. This special middle layer helps in keeping your pillow cool and fresh, constantly passing that excess heat out and through its ventilation holes as you sleep through the night. On both sides of that middle layer is the dual sides of Perfect Cloud’s special Air Comfort Gel Memory Foam. Hence the “dual sided” terming, because if you feel the pillow is getting too hot all you have to do is flip it over and you’ll have the same cooling technology ready and waiting on the other side. The dual sided pillow is wrapped in a perforated cloth that also vents out the excess heat and helps in mediating an optimal sleeping temperature for you as you sleep. Perfect Cloud’s special Air Comfort Memory Foam technology provides you with fantastic support as it cradles your head and neck as you sleep. If you move and change position, it gently changes shape with you and your every movement, keeping you comfortable. This also allows the pillow to keep your spine aligned thus reducing pressure on your neck and spine as you sleep, which may help in relieving stiffness and soreness from every day pains. The materials used to create the Perfect Cloud Dual Option Cooling-Gel Memory Foam Pillow are hypo-allergenic. Again, this is a wonderful feature, especially for those who suffer from allergies as it won’t agitate those allergies and will fight against allergens from enter the pillow’s materials. Customers who have purchased and used this pillow generally really like its function saying it is comfortable and holds it shape well. Some customers noted that it had a terrible, lingering chemical odor – again, something that is common in memory foam products but can possibly be remedied by allowing it to air out in a well ventilated room. Other customer noted that if you occasionally sleep on your side, this pillow may not be for you. It wasn’t designed for side sleepers so it doesn’t have the right support side sleepers are generally looking for making it a less comfortable choice. The Perfect Cloud Dual Option Cooling-Gel Memory Foam Pillow is a bit on the expensive side. It is, however, a more standard sized pillow measuring 24.3-inches by 15.6-inches by 6-inches. Another great option to consider for your cooling pillow is the CoolCloud Memory Foam Pillow with Stay Cool Blue Gel Top. This pillow’s design is similar to what you would typically find in other cooling pillows. The CoolCloud Memory Foam Pillow with Stay Cool Blue Gel Top is made with CoolCloud’s premium Memory Foam. This Memory Foam allows your body to feel at its most comfortable as you sleep. It doesn’t lump or clump as it instantly molds to the unique shape and curves of you head, neck and shoulders. With this technology, it allows for better pressure point relief and aligns your spine in the proper position. Again, this provided support helps in relieving your everyday aches and pains. A rectangle of advanced cooling blue gel technology has been placed and centered on the top of the CoolCloud Pillow. The cooling blue gel technology dissipates heat that your body creates and draws it away from your head, neck and shoulders. This ensures for a cool nights sleep. Like the Perfect Cloud Pillow, the CoolCloud Memory Foam Pillow with Stay Cool Blue Gel Top is also reversible. However, unlike the other pillow, this pillow only has the Blue Gel Top on one side. The other side is just the Memory Foam surface. Both sides provide the support your body needs as you sleep, you just have the option to decide each night if you want to choose to lay on a cool surface or a soft surface. The materials used to make the CoolCloud Memory Foam Pillow with Stay Cool Blue Gel Top Pillow are, like the other cooling pillows reviewed, hypo-allergenic. Once more, this is fantastic for those who suffer from allergies. Also, the materials of this pillow are not only antimicrobial, but also resistant to mold, mildew, bacteria and dust mites, giving it added protection and making it a more health conscious option. Surrounding the CoolCloud Pillow is a removable microfiber cover. This cover is very soft as it was made with premium quality. It is easily removed by using the zipper opening and is machine washable. 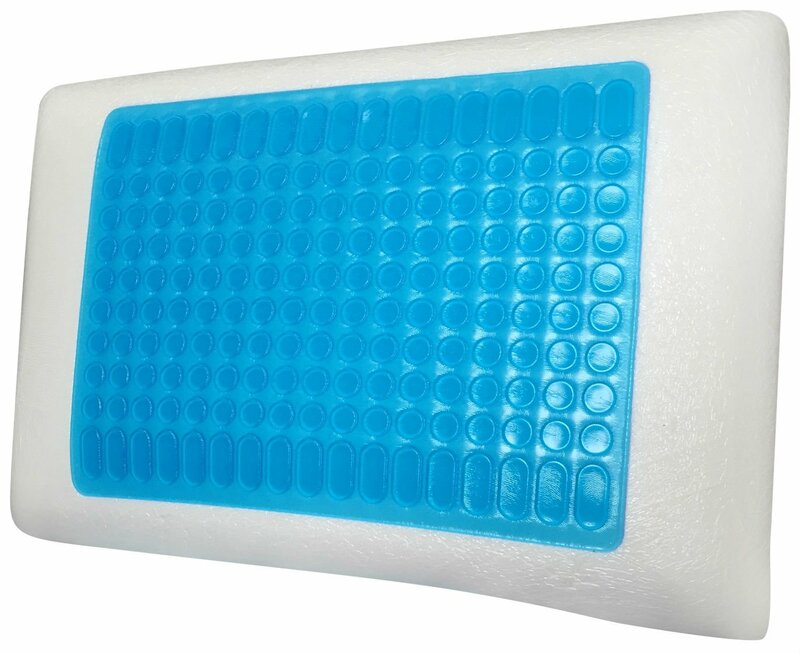 Customers who have purchased and used the CoolCloud Memory Foam Pillow with Stay Cool Blue Gel Top have generally left positive feedback in response to its function. Like the other pillows, quite a few customers noted that the pillow had a strong chemical odor that look longer than they liked to dissipate. Again, airing the pillow out in a well ventilated room might assist in making the smell go away faster. Other customers noted that the pillow became warm and didn’t maintain the cooling effect all through the night. 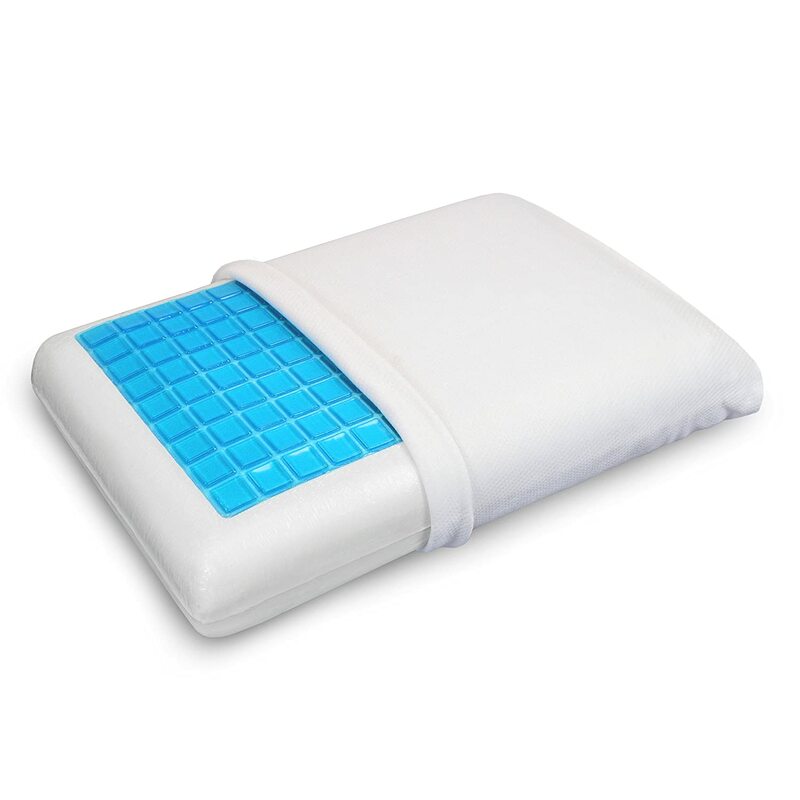 The CoolCloud Memory Foam Pillow with Stay Cool Blue Gel Top is moderately priced. It, too, is a standard sized pillow measuring 23-inches by 15-inches by 5-inches. If you’re looking for a more budget friendly, but good quality, cooling pillow, you should check out PharMeDoc Memory Foam Pillow with Cooling Gel. This pillow is designed with side sleepers, back sleepers and pregnancy support sleepers in mind. Like the other pillows reviewed, this cooling pillow is also made of high quality Memory Foam. This Memory Foam is supportive and aligns your spine to help in the relieving of pain from sore necks, poor posture, lackluster support, previous poor spinal alignment, shoulder aches, tension headaches and unwanted pressure points. You’ll wake up feeling refresh and not sore after sleeping on this PharMeDoc Pillow. Like the Perfect Cloud Pillow and the CoolCloud Pillow, the PharMeDoc Pillow is a reversible pillow, made for you to be able to use either side to sleep on. One side of the pillow features a flat surface with the blue cooling gel technology placed centered and spanning most of the surface to keep you cool and comfortable throughout the night. However, if you wish to have a more supportive sleep, the other side of the pillow is contoured for you head and neck to rest comfortable and at the right position to align your spine properly as you sleep. The breathable foam material and design promotes airflow through the pillow so it doesn’t get too warm. Like the other pillows, the PharMeDoc Pillow is also made with materials that are hypo-allergenic – great for those who suffer from allergies. Along with hypo-allergenic, this pillow is dust mite resistant, phthalate free, latex free, lead free and BPA free. Simply put, this pillow is a great health conscious choice. Wrapped around this pillow is a plush cover that is made of 60% polyester and 40% cotton. It has a zipper and can be removed from the pillow to be machine washed. Customers who have bought and used this pillow have generally left positive feedback. They love that the pillow is that perfect mixture of soft and firm, making it really comfortable to use. With that being said, several customers noted that the pillow doesn’t stay cool for very long with use. Other customers reported that the pillow is very heavy and hard to move around as they sleep. This makes it difficult to flip in the middle of the night to switch sides without having to wake more fully than they would like. Also, once more the chemical odor that is typical of Memory Foam Pillows was again mentioned – something that can be can helped with airing the pillow out in a well ventilated room. The PharMeDoc Memory Foam Pillow with Cooling Gel is a much more budget friendly price. It, too, is of standard size measuring 23.5-inches by 15.7-inches by 5.5-inches. It is important to consider what materials are used to make the pillow you wish to purchase. If you have allergies, neck pain, or any other ailment that needs special attention, the pillow you choose to sleep on could exacerbate those problems. Buying a hypo-allergenic pillow gives you piece of mind that your allergies won’t be agitated as your sleep. Buying a pillow made from all-natural products gives you piece of mind that you won’t be sleeping and breathing in harmful toxins as you do. Also, determining whether a Memory Foam Pillow or a more standard cotton or down feather pillow is more for you should be considered. Think about which type of pillow you find more comfortable? Which one gives you the support you want as you sleep? Knowing what materials are used to make whichever cooling pillow you choose, even if it isn’t one of the above reviewed picks, is just smart for both your health, comfort and your piece of mind. Knowing what position you sleep in should also be part of the considerations you list as your search for your perfect cooling pillow. This is all about alignment and comfort. Some pillows are designed with specific sleeping types in mind – i.e. back sleepers. A side sleeper wouldn’t want to purchase a pillow designed for back sleepers because the firmness, the curve of the pillow and the alignment it provides would be off and uncomfortable. Keeping in mind what position you typically sleep in at night could potentially prevent you from purchasing a high priced pillow that you simply won’t like and thus, won’t use. Everyone is different, plain and simple. Where some people like really soft pillows, others prefer harder, firmer pillows. Some of this preference may coincide with your preferred sleeping position. But considering what kind of firmness you like in a pillow is important to consider when you’re purchasing your cooling pillow. Another consideration to keep in mind when looking into purchasing a cooling pillow is the support it will potientally provide for you. Part of the appeal to the cooling pillows that are made with high quality Memory Foam is the support to the head, neck and shoulder so many boast to help provide you with as you sleep. That support helps relieve many aches and pains that you have from everyday life. Making sure that you purchase a pillow that provides you with the right kind of support is important because otherwise you could be waking up with neck and/or back cramps and headaches. Choosing the best cooling pillow for you can be an exhausting task. So many choices are available, and at varying price ranges. Even if you decide not to purchase one of our top choices, it’s important to keep those few considerations in mind so you’ll find the most comfortable pillow for you. Remember to check what materials are used and if it is Memory Foam or something else the cooling pillow is based on. Also think about what position you tend sleep in at night so you don’t buy something that isn’t made for your preferred sleep position. Lastly, consider the pillow’s firmness level and the support it will give your head, neck and shoulders as you sleep. Being comfortable is one of the most important things for falling and staying asleep at night, and all of these factors will affect that comfort. No one wants to be hot and sweaty, tossing and turning at night because they didn’t do the proper research on their pillow. Especially if you’re spending more than a little extra cash on said pillow.